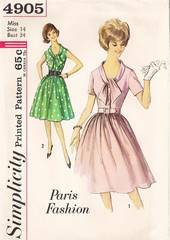 Paris Fashion Simplicity pattern from the early 1960's. Dress has lowered front neckline finished with a tie collar with shaped ends. Bodice has button closing. Gathered skirt has a concealed opening under pleat at center front. Self fabric or purchased belt. Sleeveless or short sleeves. Uncut, complete and in factory folds. Envelope and contents are in very good condition.